This is another flashback post. I wrote this in high school for my Research and Exposition class with Mr. Rickert. I think the topic was to describe our favorite food or explain a recipe. I was going through a phase where I would microwave cookie dough and eat it so I wrote about that. For a high school paper, it’s not too poorly written. Cookies are my biggest weakness. I can never refuse one and I always eat too many. There have been times when I’ve eaten a couple of cookies every single day for a week or two. I enjoy cookies as an after breakfast snack, a post dinner snack, a snack while I watch television, and as simple comfort food. Whenever I eat or bake them myself, I always feel warm and fuzzy inside. They have a magical ability to always put a smile on my face. I’m not a very good cook. I am, however, good at following the instructions on packages and using the microwave, so I am thankfully able to make chocolate chip cookies. Whenever I bake cookies, I typically use the Betty Crocker dried cookie mix powder package. My parents always make sure to keep at least one or two packages of cookie mix in the pantry, just for me. Occasionally, my family does buy raw cookie dough but this is an unwise decision because we end up eating just the raw cookie dough and never actually baking the cookies. The cookie mix makes cookies very simple to make. All you have to do is mix a stick of melted butter, an egg, and the cookie mix powder, then stir. Next, you roll the dough into small balls and place them onto an ungreased baking pan. Last, you bake the cookies at 375 degrees Fahrenheit for about ten to twelve minutes in the oven. I normally cook them for ten minutes because I prefer slightly undercooked cookies and because I’m a very impatient person. I strongly dislike burnt or hard cookies. The best type of cookie to me is a warm, soft, fresh one. The cookie must fall apart in your hands, gooey chocolate must cover your fingers, and the steam should be visible because it’s fresh out of the oven. The store-bought cookies, such as Chips Ahoy, are no match for a home baked cookie. Store-bought cookies are always too hard and crunchy, like rocks, and you can practically taste the factory when you eat one. Gross! There is only one cookie that can even compare to my home baked chocolate chip cookies. 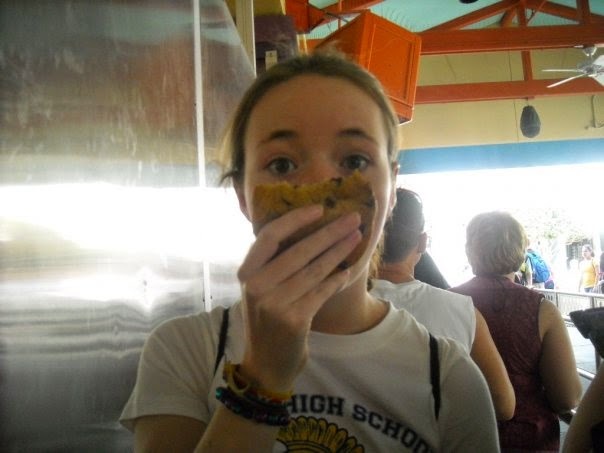 I discovered this cookie at Walt Disney World when I ventured into a candy store by myself. The moment the giant massive chocolate chip cookie caught my eye I knew that I had to have it. This was no ordinary cookie. It weighed almost two pounds and looked like a giant mound of slightly baked cookie dough. It looked like it was somewhat undercooked, making me even more excited. So I went and found my parents and asked them to buy it for me,and since I’m an only child they naturally bought it for me. When we returned to the hotel, I plopped myself down on a comfy couch with my cookie in hand and started to munch on it while watching TV. My mom saw me, and warned me not to eat the entire cookie in one setting. I acknowledged her suggestion but continued to eat it. Before I knew it, my delicious cookie was gone and my stomach made an unfriendly gurgling noise. It was the best cookie I ever had but it was also the worst stomach ache I ever had.
. I like to eat chocolate chip cookies with fat free white milk, if it is available. Like many other people, I dip my cookie in the milk, let it soak up the milk for a few seconds and then eat it. I also like to bake cookies especially in the late evening, on random occasions and surprise my family with them. I tend to bake cookies only if I’m still hungry after dinner and if I’m bored. The cookies that I make myself always taste the best. Whenever I bake chocolate chip cookies I always eat at least one uncooked cookie and then two or three baked ones. I also have to make sure that every last ounce of cookie dough is licked off of the bowl and the spoon used to mix it, because it is a sin to waste cookie dough. When I sink my teeth into a warm chocolate chip cookie, it feels like heaven. I hear an angelic choir in my head and I feel like nothing in the world could ever be better than this. They always make me grin and think of all the other good things in life. The chocolate melts on my tongue and the soft cookie just glides down my throat. The smell of a chocolate chip is almost as good as the real thing. When they’re in the oven, my nose goes crazy because of their irresistible smell. When I die and go to heaven, I can only hope that there is an oven and chocolate chip cookie mix waiting for me. I would want nothing more than to be able to eat as many warm, undercooked chocolate chip cookies as I wanted all day long for eternity.